In the past two days, the Florida Gators football team has added four verbal commitments: three in 2016 and one in 2017. And everything seemed to be going well for Jim McElwain and his staff. But things just hit a bump in the road. According to InAllKindsOfWeather.com’s Neil Shulman, two Florida Gators have been cited for a dine-and-dash-incident from July 4. 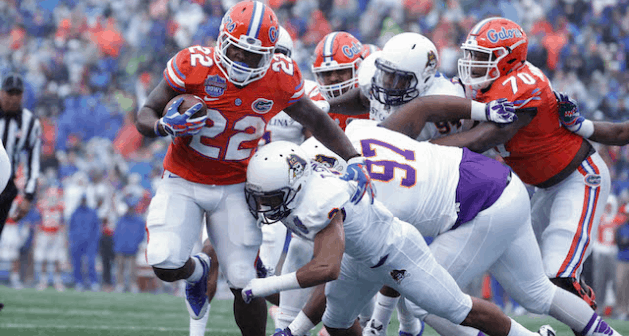 According to Shulman’s source, running back Adam Lane Jr and defensive lineman Caleb Brantley were a part of a group that compiled a $90 tab at Splitz Bowling Alley in Gainesville, Fla.
Lane has reportedly settled his portion of the tab already. It was a stupid mistake made by two kids. It showed poor judgment, but Jim McElwain will surely keep them in line from here.